2014 has already been an exciting year for Eric Carle! He is celebrating the 45th anniversary of his book, The Very Hungry Caterpillar. In April, he experienced what he called the "Easter Miracle" when he spoke to the childhood friend who was the inspiration Friends after losing contact with for 82 years. Now today, June 25th, he celebrates his 85th birthday! Eric Carle has touched the lives of so many children with his classic picture books and his influential work continues with The Eric Carle Museum of Picture Book Art (which I hope to visit someday!). 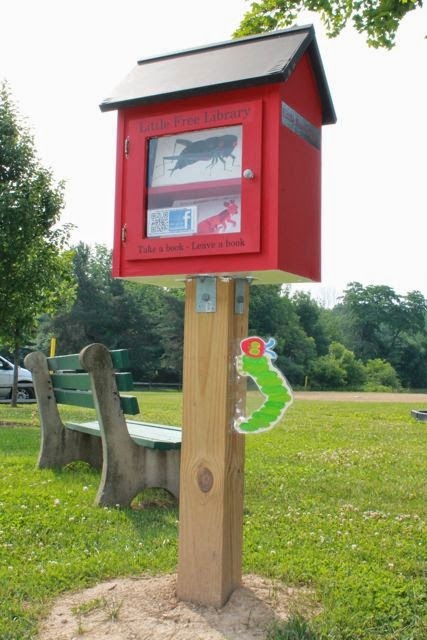 Did you know every 30 seconds a copy of The Very Hungry Caterpillar is purchased somewhere in the world? It is simply amazing how important Eric Carle is to us all. Our birthday celebration started rather serendipitously. I returned home after running an errand. 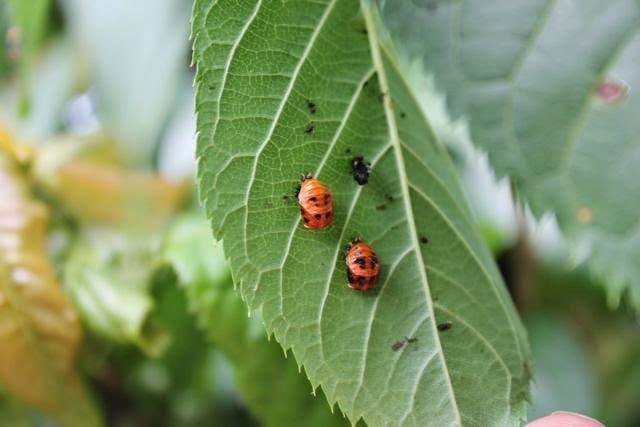 My wife was on the computer and said, "We have a bunch of strange bugs crawling around the cherry tree in the front yard." Then she immediately said while pointing at the computer screen, "Aha! That is the bug!" 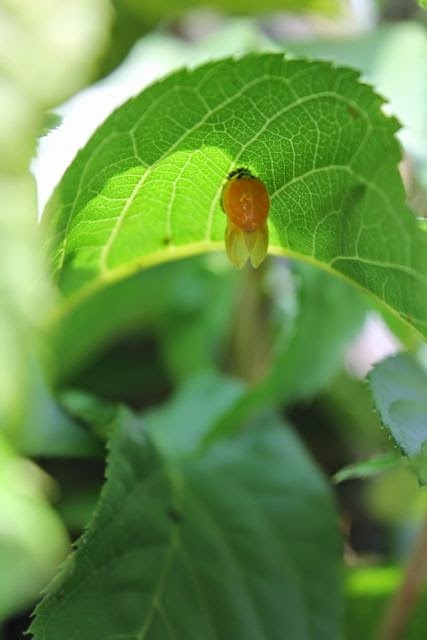 She found a picture of the bug in a Google Image Search, clicked the image and found out it was a ladybug larva! We went outside together, took the camera, and this is what we saw. 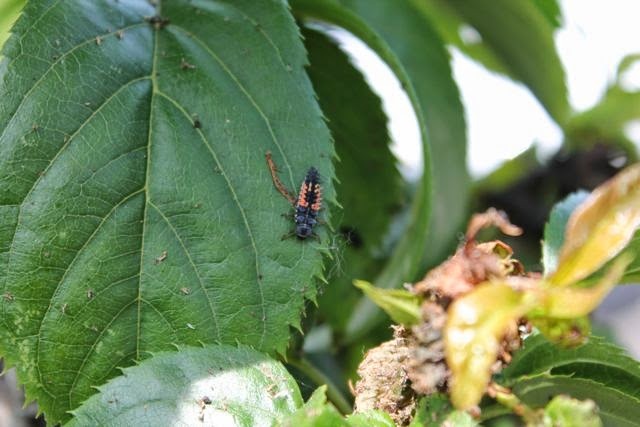 Ladybug larvae were crawling all over the tree! 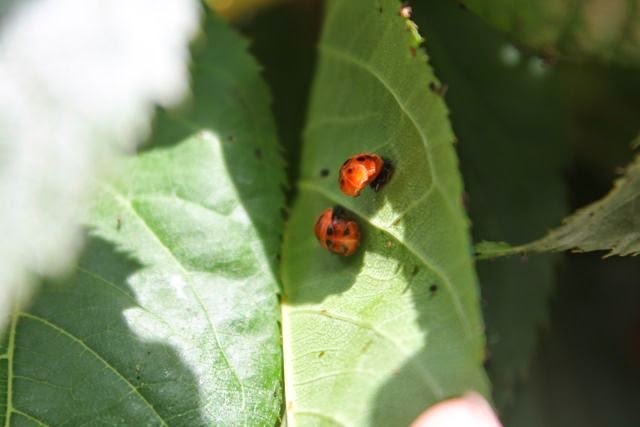 According to Ladybug-Life-Cycle.com, female ladybugs lay eggs where they know their larvae will immediately find food. 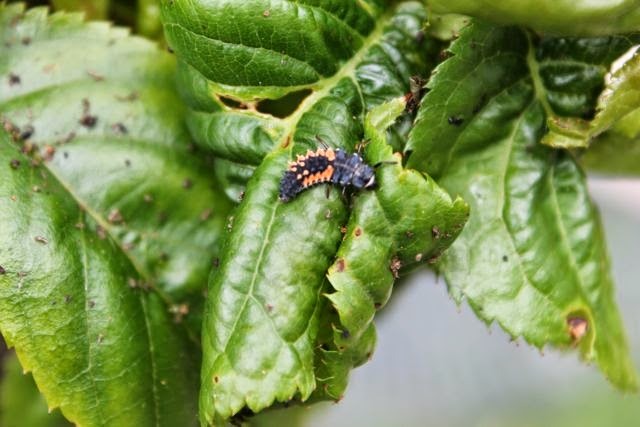 Ladybug larvae love to eat aphids and other mites. This particular tree also has lots of carpenter ants who also love aphids so there must have enough aphids for everyone to share. In Eric Carle's The Grouchy Ladybug, two ladybugs meet on a leaf covered with aphids. The friendly ladybug suggests that they share, but the grouchy ladybug insists on fighting for the aphids. 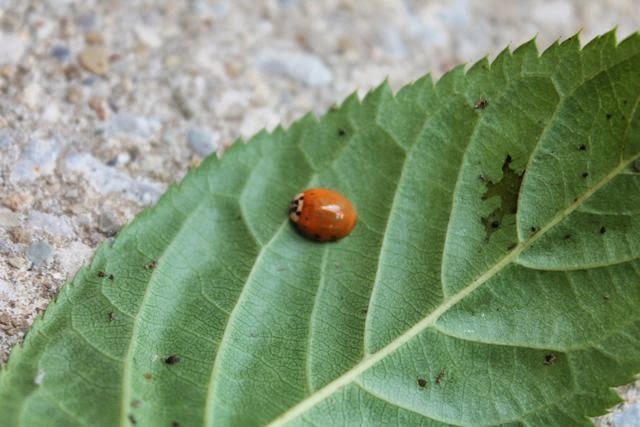 When the friendly ladybug agrees to fight, the grouchy ladybug backs down and flies away to grouchily confront many other animals before returning to the leaf at the end of the day. 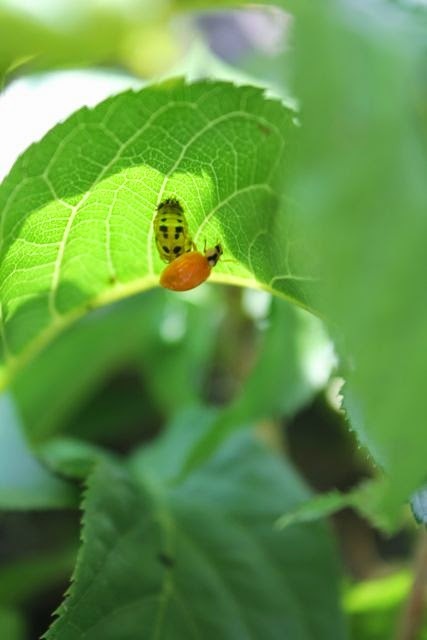 This time, the grouchy ladybug is friendly and dines upon the remaining aphids. Upon, closer inspection we found larvae that had entered the pupa stage! 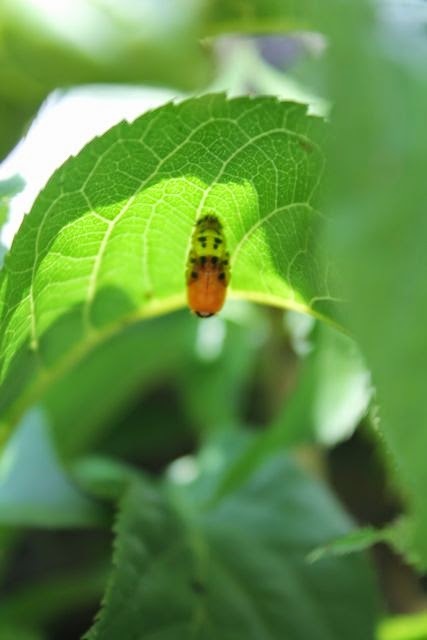 Once again according to Ladybug-Life-cycle.com, a larva grows and eat aphids and mites for a couple weeks and then enters the pupa stage which lasts only a few days! 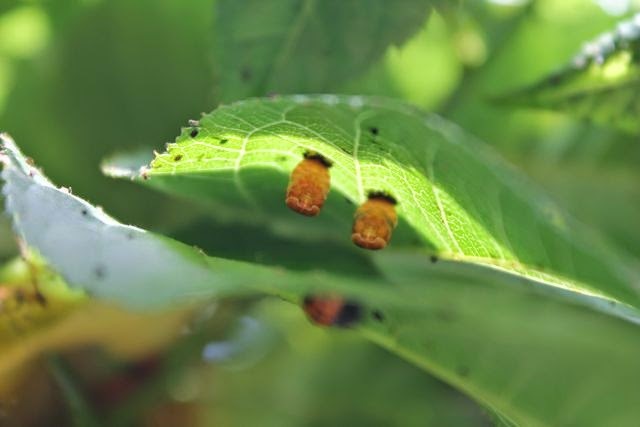 Then, the larva experiences metamorphosis and changes into a ladybug! We were quite excited to have this happening right in our front yard. 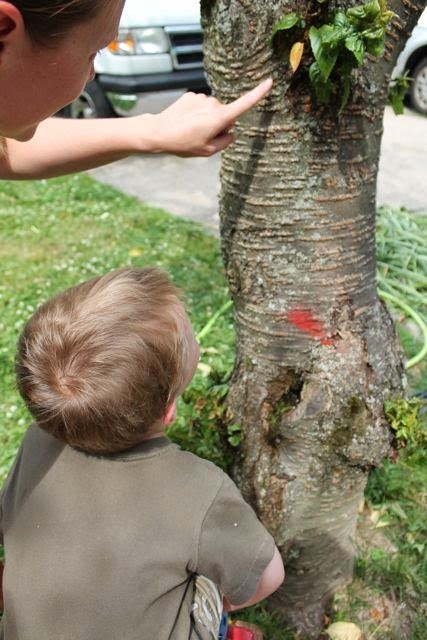 My children enjoyed observing the larvae crawling around the tree. 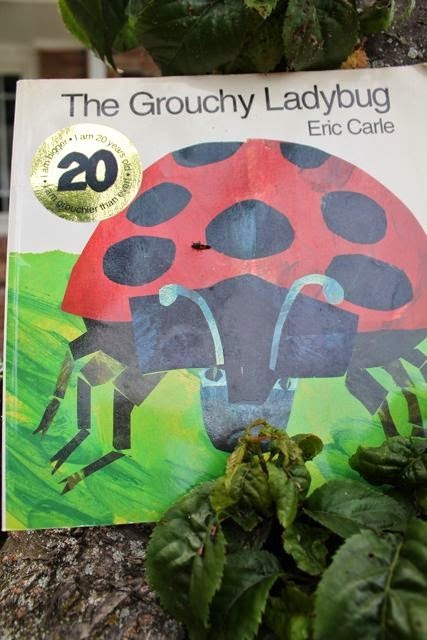 It dawned on me that Eric Carle's birthday was just a few days away and that reading The Grouchy Ladybug under the tree would be the perfect way to celebrate! 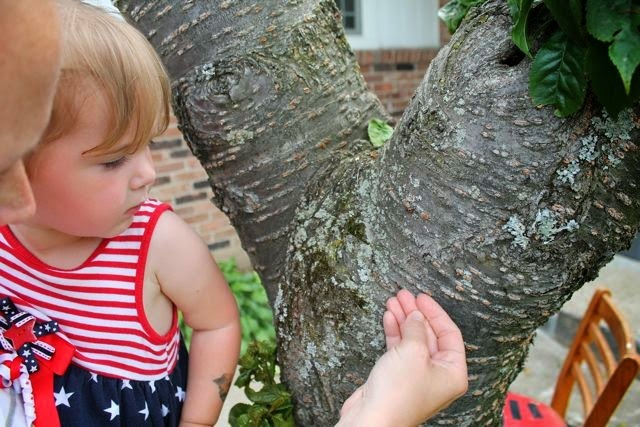 My wife tried to get a ladybug larva to give my daughter's closer look. We found pupae she could see too! 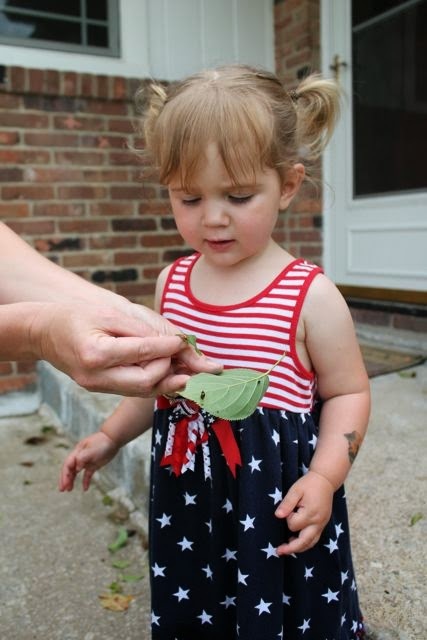 Then, she observed a larva skin that a ladybug had left on a leaf after metamorphosis. 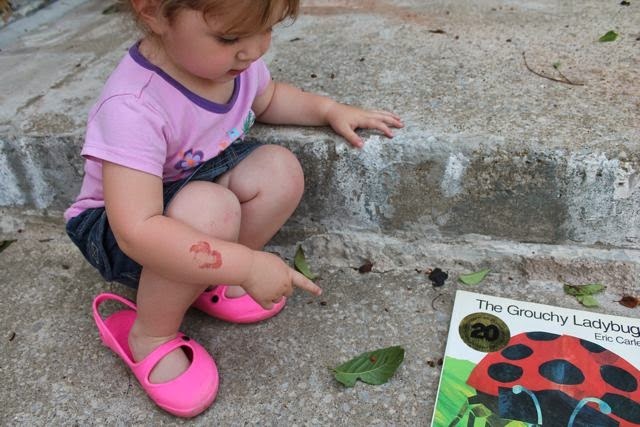 The next day, my daughter and I read The Grouchy Ladybug on the steps under the tree. She wore her sister's fancy pink shoes! 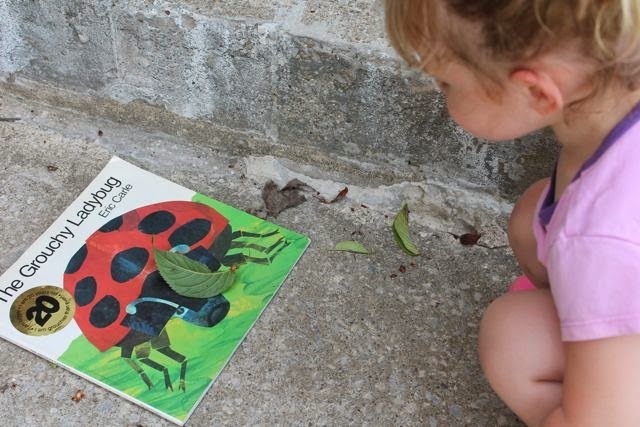 We found a ladybug and let it crawl on the book to meet The Grouchy Ladybug. We hoped he would not be too grouchy and wouldn't want to fight our ladybug. 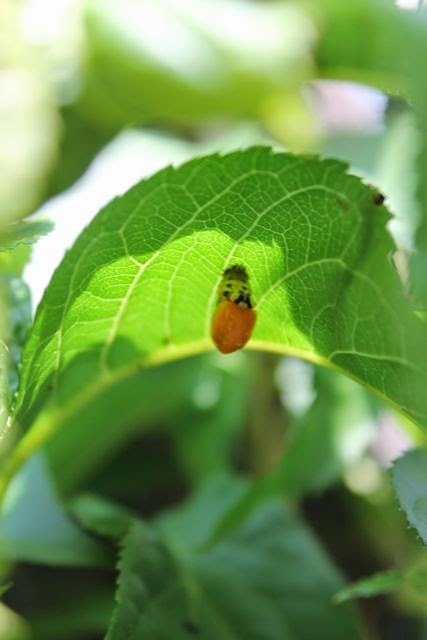 While we were outside we saw a larva emerging as a ladybug. After coming out, it turned itself around and rested on top of the skin. Then, it extended its wings. We thought it must be drying its wings just like a butterfly does after it emerges as "a beautiful butterfly". We are so happy that these ladybugs chose our tree. We learned so much and had a birthday celebration for Eric Carle that we will not forget! 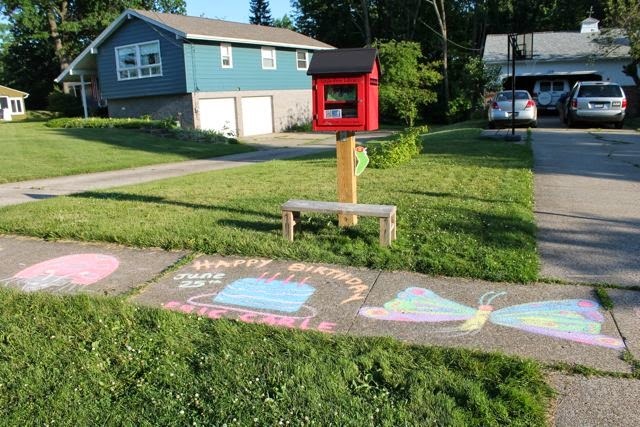 This is Little Free Library is in front of our house. Our family decorated the sidewalk too! 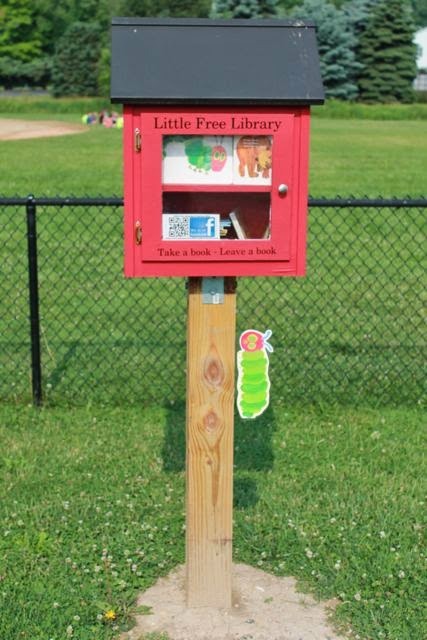 On June 25th, I will be hosting story times at each Little Free Library. I will be reading my favorite books by Eric Carle. (Schedule: 9am - Sunny Lake, 10am - Craddock Elementary, 11am - Kiwanis Moore Park, 12pm - New Life Assembly Church, and 1pm Four Seasons.) It should be a fun day (if the rain stays away)!